Step 1 Remove husks from tomatillos, then wash under running water. Combine tomatillos and water in saucepan. Bring to boil and simmer until tomatillos are tender, about 10 minutes. Puree with liquid; set aside. Step 2 Coat skillet with cooking spray. Saute garlic, onion and chile in oil until tender, 1 to 2 minutes. Stir in tomatillo puree. Bring to simmer and cook until puree thickens slightly, about 5 minutes. Season with salt and lime juice. Step 3Put filets into 4 individual baking dishes. 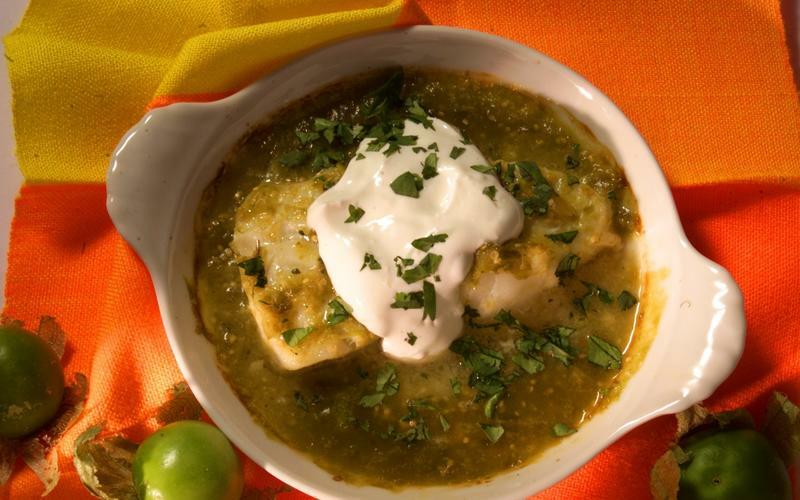 Pour tomatillo sauce over fish. Bake at 375 degrees until fish flakes easily when tested with fork, about 30 minutes. Just before serving, spoon sour cream over fish and sprinkle with cilantro. In Recipes-list.com we have selected the most viewed recipes from category - Fish and shellfish Healthy eating Main courses Quick and easy . Enjoy the best recipes specially selected for you! Baked Chilean sea bass with tomatillo sauce is the right choice that will satisfy all your claims.